Country Terrace Everyday Hero recipient Brenda Ring is pictured here with her award. Country Terrace personal support worker (PSW) Brenda Ring is described by residents and her co-workers as being kind, dedicated and always available to help others at the Komoka, Ont. long-term care home. She also does her job each day with a smile that others notice. 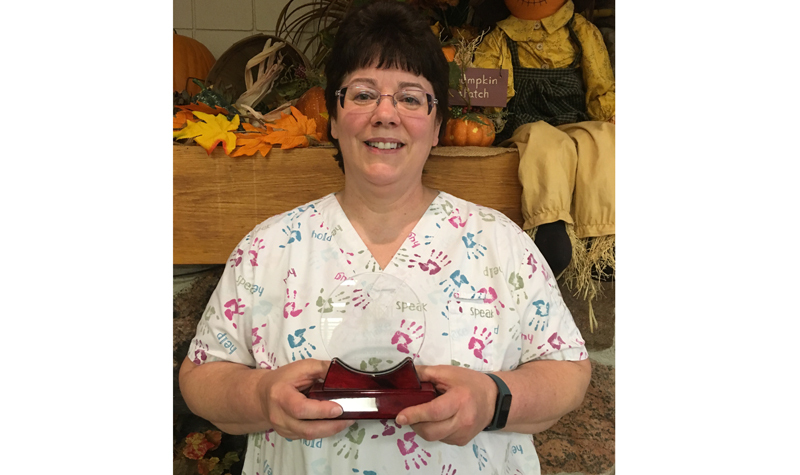 To acknowledge Brenda for her efforts and dedication to others, the Country Terrace team presented her with the home’s 2018 Everyday Hero Award at a recent ceremony. “She is one of our best PSWs who comes to work every day determined to give 100 per cent to her residents,” Karen Dann, Country Terrace’s administrator, says of Brenda. She adds that Brenda’s dedication to others is noticed by everyone at Country Terrace. “Brenda has a heart of gold and it shows in her work, and residents and families alike can see how much she cares and takes pride in her work,” Shelley says.